International Journal of Research in Health Sciences,2014,2,1,263-273. Introduction: To determine the prevalence of different oral habits, habit related oral lesions and association between them among the study population. Materials and Methods: The study group comprised of 2,161 patients with positive history of oral habits. Associations between the lesions with various age groups, gender, education levels, number of habits, type of habits and duration of habits was estimated. Results: Prevalence of oral habits was 17.54%. Indulgence in habit was seen more among males between age group 26-55yrs and most of them had education above high school level. Smoking (51.9%) was most common oral habit, followed by chewing tobacco (47.52%), consuming alcohol (29.7%) and chewing pan without tobacco (16.7%). Tobacco chewing was more common single habit. 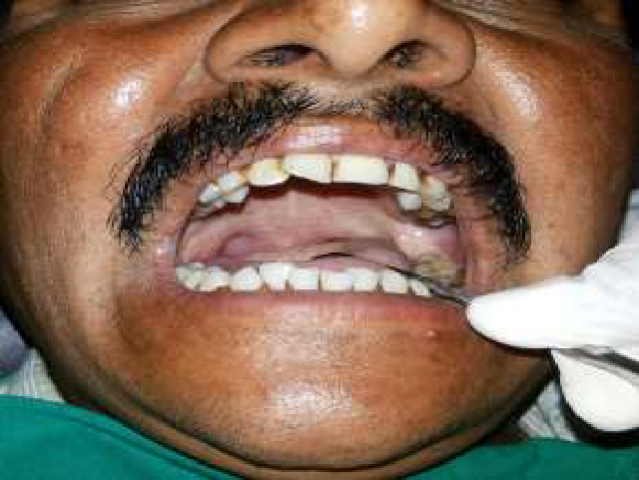 Prevalence of oral mucosal lesions was 46.1%. Reactive lesions (55.41%) were the most common followed by premalignant lesions/conditions (27.67%), malignant lesions (12.40%) and other lesions (4.49%). Reactive lesions were more common among smokers (68.98%) and alcoholics (40.03%). Premalignant (31.46%), malignant (12.08%) and other lesions (3.99%) were more common among tobacco chewers. Chronicity and increase in number of habits was associated with increase in number of lesions. Conclusion: Oral mucosal lesions were observed in almost half of the subjects with oral habits. Pre malignant and malignant lesions were more commonly associated with tobacco chewing habit. Number of oral mucosal lesions increased with the number of oral habits and with duration of indulgence. This study helps in public awareness about the ill effects of oral habits and may motivate them in overcoming their indulgence.